Today is International Women’s Day, so let’s celebrate the life and accomplishments of a remarkable California woman. March Fong Eu started her career as a dental hygienists after achieving 3 advanced degrees from Berkeley, Stanford, and Mills College. Then she began a career in politics serving on the Alameda County School Board, before getting elected to the CA State Assembly in 1966. There she became known for her campaign to eliminate public pay-toilets, arguing that urinals were free and therefore represented discrimination against women. 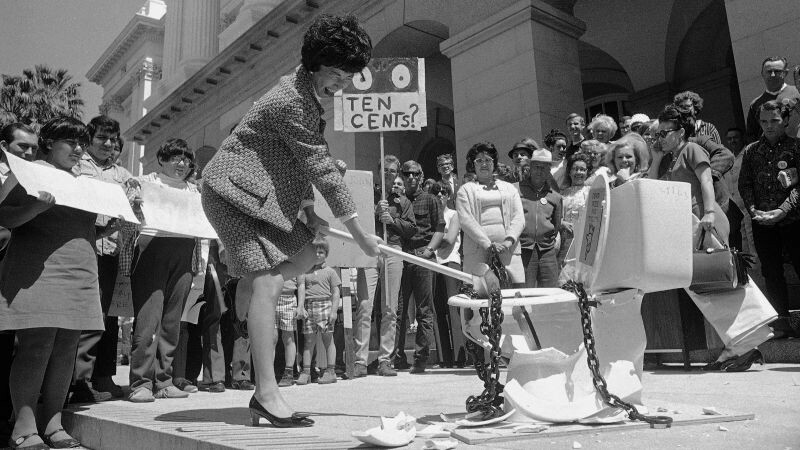 She’s pictured above smashing a toilet wrapped in chains on the state Capitol steps. Fong Eu became the first Asian American woman elected to a state constitutional office when CA elected her Secretary of State in 1974. She served as acting governor in 1976 when Jerry Brown was out of state. She was also the first to introduce voter registration by mail and post election results on the internet, making a mark on accessibility. Fong Eu died in Irvine, CA in 2017, aged 95.